One of the things I always look for in a piece of writing is the occasion for its telling. In other words, why are we, the readers, seeing this particular moment on this particular day in this particular year? It might seem very obvious to ask that question, but I sometimes find writing that doesn’t exactly make this occasion clear (or maybe the writers don’t take full advantage of the opportunities they’ve given themselves). Occasion, to me, signals the story’s raison d’etre; Thoreau says in Walden, “The orator yields to the inspiration of a transient occasion.” Meanwhile, Flannery O’Connor called her stories “occasions for grace”; when I think about grace, however, I don’t veer toward divine guidance or spiritual deliverance the way Thoreau or O’Connor might. When I think of grace, I think of baseball. Now, when I Google “quotes about baseball and grace,” I get a lot of hits featuring quotes by Chicago Cubs’ 1st Baseman Mark Grace. (My favorite so far: “I knew I had to get on base for anything to happen. I thought to myself, a concussion heals in 30 days, right?”.) Jokes aside, any fan of this sport should be more than willing to describe baseball as carrying a kind of “grace.” Think of its miraculous moonshots and incredible double-plays, its signature crack of wood and smack of glove leather. However, I mention baseball (and grace) as sleight-of-hand vehicles here. They’re mostly in service of my telling you that when I think of the most perfect example of “a storytelling occasion,” I think of the first one hundred pages of Don DeLillo’s masterpiece, Underworld. And what’s the occasion for beginning such an wide-ranging investigation of 20th Century American death and progress? A baseball game. 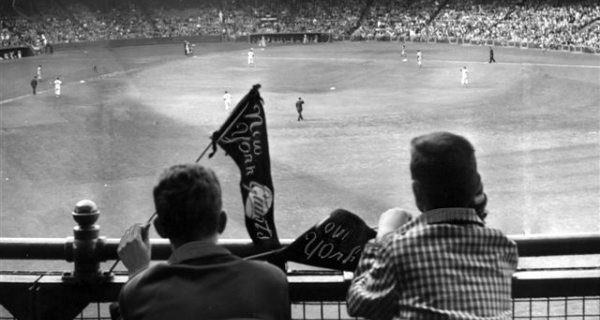 The novel opens on October 3, 1951, when a boy named Cotter Martin sneaks in to watch the New York Giants play the Brooklyn Dodgers. Also in attendance are none other than Jackie Gleason, Frank Sinatra, and J. Edgar Hoover, among other celebrities of the era. In the ninth inning, Bobby Thompson hits a three-run homer, beating the Dodgers 5-4 and capturing the NL pennant. This hit became known as “The Shot Heard ‘Round the World.” In DeLillo's novel, Cotter catches the ball and runs home while everyone else in attendance realizes they’ve witnessed something utterly historic. I’ve taught part of this opening section of Underworld to students at Lighthouse for different craft and content purposes. No matter what, students always discover new insights and gain greater understandings every time we read it. Above all, I always try to remind them—as much as I try to remind myself—that these opening hundred pages are themselves a masterclass on “storytelling occasion.” This is to say, when I come to the blank page, I know that I need to have an occasion to tell a story that is on par with Underworld’s occasion. I’m not saying it needs to rise to the same grandiloquence and cultural vertigo of DeLillo’s opening; instead, I’m saying that my work needs to center around an important moment, even if that moment isn’t the actual plot of the piece. Without that occasion, why am I beginning to tell the story? And why, then, are you beginning to read it? This brings me back to this aforementioned concept of grace. But what I really want to do is simply acknowledge that this particular piece of literature from DeLillo changed me the first time I read it. And every single time I read it now, it changes me. Sometimes joyfully, sometimes in awe, sometimes full of pain. Like Mark Grace’s concussion protocol, part of me believes I’ll heal in thirty days from this shot to the head. But deep down, I know I won’t. This is what literature should do; this is what it has done for me, over and over. And I’m thankful for that bestowed dignity of change—the graceful arc of a literary homerun. Alexander Lumans was awarded a 2018 Creative Writing Grant in Prose from the National Endowment for the Arts. He was chosen by Philip Roth as the Spring 2014 Philip Roth Creative Writing Resident at Bucknell University. He was also awarded a fellowship to the 2015 Arctic Circle Residency, where he sailed in a tall ship around Svalbard, Norway. His fiction and nonfiction have appeared in The Paris Review, Guernica, Glimmertrain, The Walrus, Gulf Coast, TriQuarterly, Off Assignment, Story Quarterly, Black Warrior Review, American Short Fiction, Sycamore Review, Forty Stories from Harper Perennial, Blackbird, Cincinnati Review, and The Normal School, among others. He has been awarded fellowships to MacDowell, Yaddo, VCCA, Brush Creek, Blue Mountain Center, and Norton Island as well as scholarships to the RopeWalk, Sewanee, and Bread Loaf Writers Conferences. He received the 2015 Wabash Fiction Prize from Sycamore Review, the 2013 Gulf Coast Fiction Prize, and the 2011 Barry Hannah Fiction Prize from Yalobusha Review. He graduated from the M.F.A. Fiction Program at Southern Illinois University Carbondale and now teaches at University of Colorado Denver and Lighthouse Writers Workshop.